It’s more than a year and a half since we first reviewed Gremio (see here) but little has changed, although the lighting is better and the number of customers has swelled. It lies underneath St Matthews Church with the entrance down some steps on the northern/town centre side. The crypt is a restaurant and bar with tables outside overlooking the Peace Garden – even in the depths of a winter’s night there were a few hardy souls or perhaps committed smokers sitting there. It is a bit like a cut down version of the Mezquita in Cordoba. Lots of pillars obscuring the view of the other diners, making the spaces a bit more intimate (so might be good for Valentines). The bar is dark and looks smoky, although, of course, it isn’t, but the spaces are again small and dark. The restaurant tables have overhead lights, making it possible to read the menu. 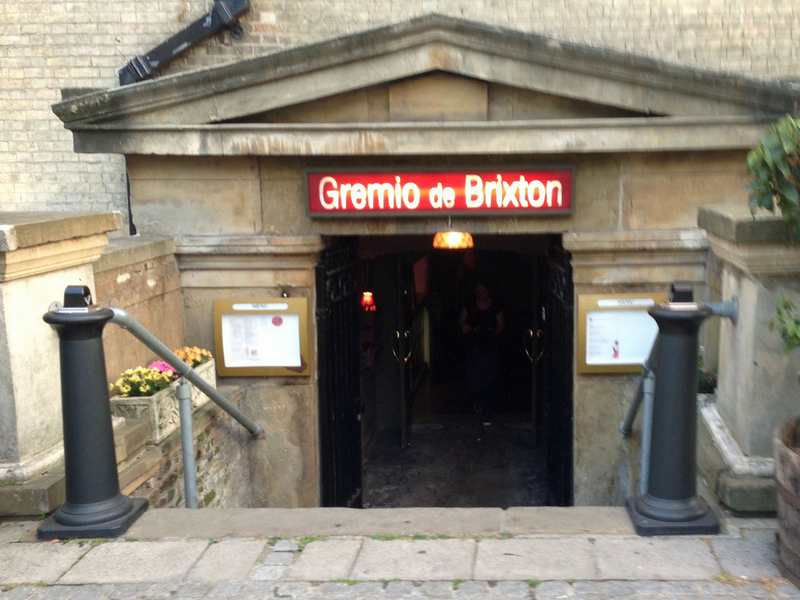 We have no idea why we have waited so long to make a visit to Gremio de Brixton. It is underneath St Matthews Church – a place we know well as one of us went to playgroup there. But now the whole of the crypt has been turned into a restaurant and bar with tables outside overlooking the Peace Garden. But there was no room outside on such a warm evening so we headed into the dark cool depths to the cellar like rooms. It is a like a cut down version of the Mezquita in Cordoba. Lots of pillars obscuring the view of the other diners (although there were none when we visited). All the small tables were lit with a single candle but with overhead lights making it relatively easy to read the menu. The ceiling is low, the music loudish and we thought when full the noise would echo off the plain brick walls and pillars. But nonetheless we thought it was a fantastic venue.